With its background of OG Kush and Grape Ape, King Kush contains flavors of citrus, pine and kush. With a gradual but powerful high, King Kush is famous for its potency and shiny trichromes during flowering. 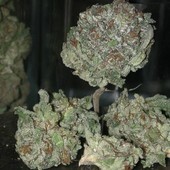 This strain comes across as sweet and sour with its powerful and tangy grape scent, and some hints of lavender. Looks: Deep green, spiky fully crystallized marijuana nuggets with deep purple/black hues. Smell: Funky like old musty cologne. Hints of cheap red wine. Taste: Unlike the smell, this was had a sweet tea leaf taste with a sweet after taste. Buzz Type: Relaxing full body high. Slightly euphonic, very mellowing. * For a strain that smokes very smooth and produced large smoke exhales as well as a loaded bowl providing many good rips, King Kush initially had a smell that reminded me of my garbage can after the trash man emptied it. King Kush was a very flavorful kush strain providing a sweet tea taste in my large bong. My bubbler produced the same "taste" with an added hint of sweet mint such as Wrigley's Spearmint gum. This is one strain where the initial scent was nothing like its taste. This strain was very "thick" and marijuana nuggets were very sticky to the touch. Even after a few weeks of storage, this strain kept its stickiness. I had to clean my scissors often snipping up this strain. King Kush was a nice chill out stay at home and sit on the couch watching sports kind of strain. This one really did not couch lock me, but on nights when really tired and sore this one aided me into a really good night's sleep. I smoked a bowl and drank a can of Rockstar Relaxed and I was knocked out. I really liked this strain after a long day of work or just heading off to bed. King Kush was really great in relieving my "eye pressure" after staring at a computer and data all day. It was a very excellent strain at handling pain relief as my muscle aches and pains were well managed on just a single bowl without the need to reload often. Thus, this was a nice strain to medicate with have after a workout or jog. My only negative... although my eyes felt great "internally;" if that makes sense, I did catch some serious dry eyes. I noticed I had to use "artificial tears" quite often while medicating with this strain. Due to this, King Kush was for when I stayed indoors at home and/or not driving (especially at night).